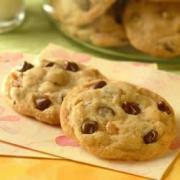 [The Cookie Elf File] Best Chocolate Chip Cookie Recipe – in Honor of National Chocolate Chip Day! This classic chocolate chip cookie recipe uses double the usual number of chocolate chips and produces a soft texture. Bake a few minutes longer to get a crisper cookie. Get the full recipe for The Best Chocolate Chip Cookies and some special baking tips from The Elf. Plus be sure to check out The Elf’s Chocolate Chip Cookies Pinterest board for more cookie inspiration.